Do you get together with family or friends for potluck dinners? Is there a specific dish that you are asked to bring … frequently? The hubby’s family always wants me to bring Carrot Cake. 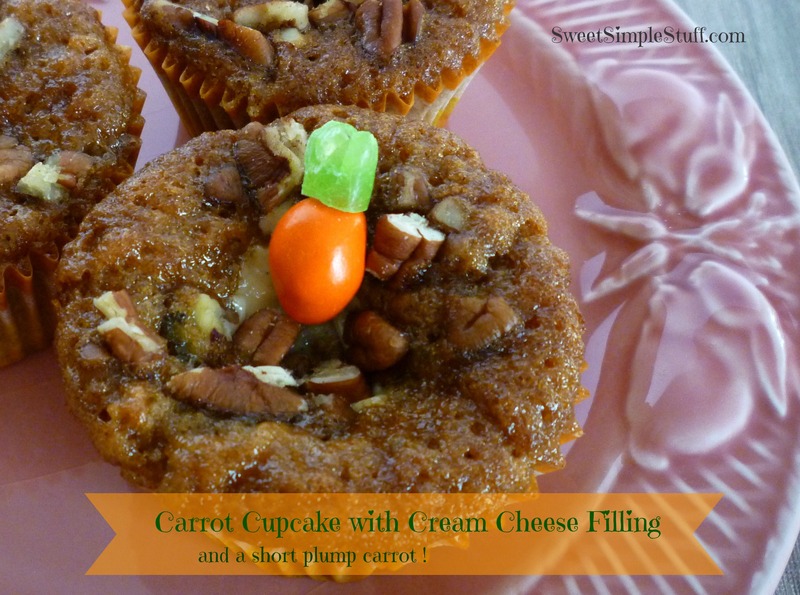 So, this past weekend I took my usual Carrot Cake … with a twist … the cream cheese is on the inside … no frosting on top! Preheat oven to 350°F. Line cupcake pans with paper liners (24). Make the cake batter – In a large mixing bowl beat oil, 1-1/2 cups sugar and 3 eggs together well. In a separate bowl sift or whisk together the flour, salt, cinnamon and baking soda. Add dry ingredients to egg mixture and beat together. Add carrots, pineapple and mix well. Pour into prepared cupcake pans. 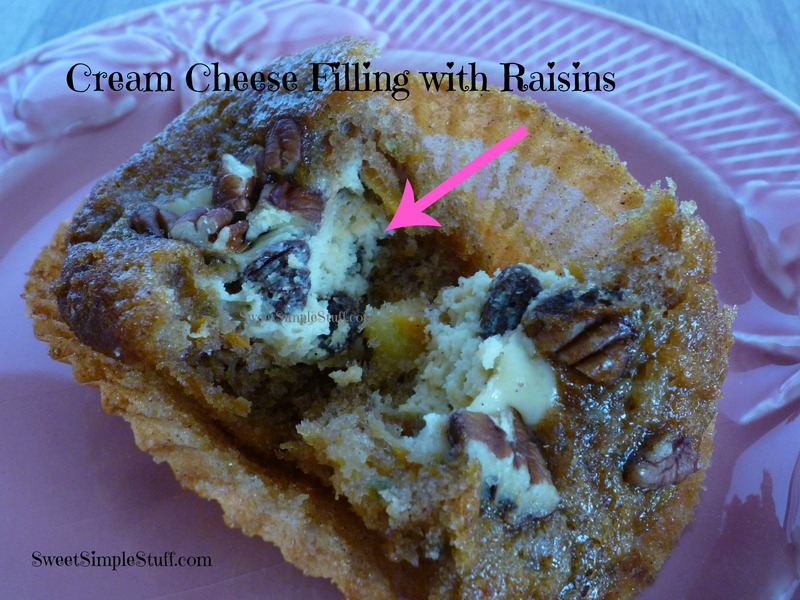 Make the filling – In a medium bowl beat cream cheese and 1/3 sugar until creamy. Add 1 egg, raisins and mix well. Spoon on top of cupcake batter. 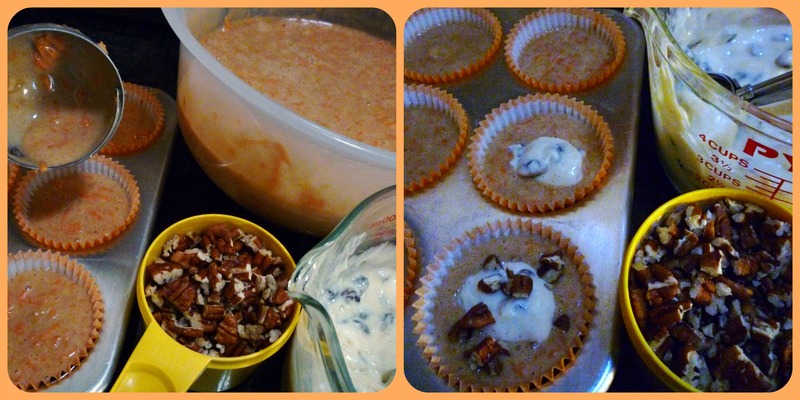 Sprinkle each cupcake with nuts. 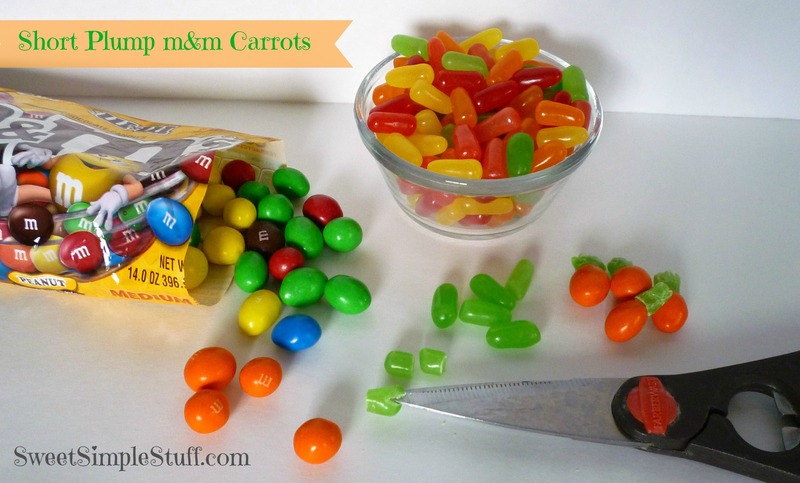 Beth at Hungry Happenings made the cutest little carrots with Almond m&m’s and Mike & Ike’s. I intended to copy her and place them on my carrot cupcakes Saturday evening. I went to the grocery store Saturday morning … no Almond m&m’s !!! So, I bought Peanut m&m’s … resulting in short plump carrots. Use kitchen shears to cut a green Mike & Ike candy in half and snip the rounded end. Place the sticky end on the m&m! Visit Hungry Happenings to check out the carrots and more detailed instructions. What dish do you like to take to potlucks? OMG … I am going to try this recipe as soon as I have a free hour or two! I’m so happy you were inspired to add the candy carrots to your cupcakes. The peanut M&M’s were a good substitute for the almond ones and they look great on top of your mini cakes. Thanks for sharing the idea with your readers!!! The carrots are perfect! It’s a shame they didn’t have any almond M&Ms, though. Thanks Brenda for the carrot cupcakes—They were delicious. But then again all your creations are yummy and delicious. 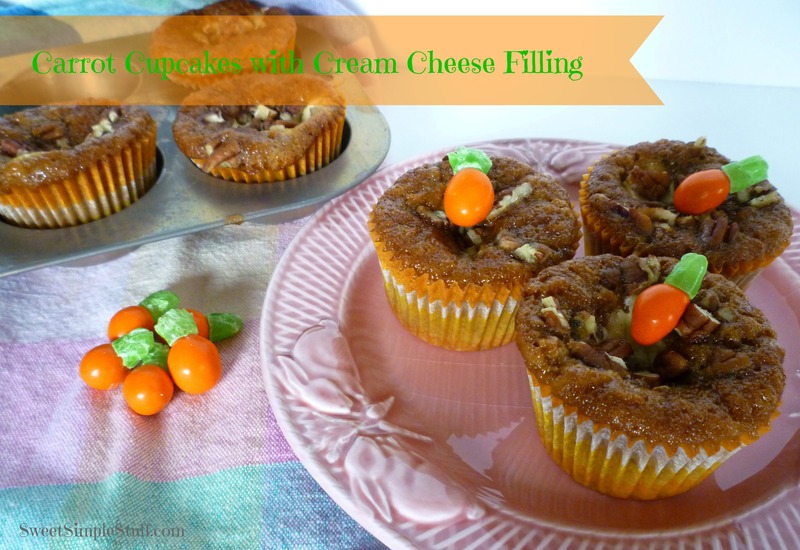 ooooh…carrot cakes with filling inside…ingenious! These look great! I am always asked to bring my lasagne or my tapioca lychee pudding. I’m not a big hand of icing but do enjoy my cream cheese and these sound perfect and will be perfect for my taste buds. Thank U 4 the recipe. Think I will use fondant when it comes to making my carrots tho or using orange jelly beans;cutinng a slit on top and inserting piece of green whip candy for grass. I think a person can also buy candy ‘grass’ at Target. I love your recipe! And I love Beth’s little carrot treats! All together with the filling…, yummy! Love the idea of the filling instead of frosting, Brenda. About dividing M&Ms: I bought some and sorted them by colors (yellow for the chicks, other colors for other potential projects). Oh shoot, someone ate them all! How funny – I just made something very similar yesterday (minus the cool carrot decorations)! I could eat carrot cake any time of the year too!!! Love the cute carrot M&M’s!! !